Thanksgiving is over. That 14 pound turkey is history. Or, is it? Quite a bit of it is in the freezer in some form or another. Stock. Soup base. This year my local Maple Lawn Farm turkey was the subject of an experiment. How best to cook the big bird. I did three different preparations. Using The Food Lab as inspiration. I cut the turkey in half. Cut half of it in half. That gave me three blank canvases to use. Half of it I dry brined. Mixture of salt and Provencal herbs. Massaged under the skin. 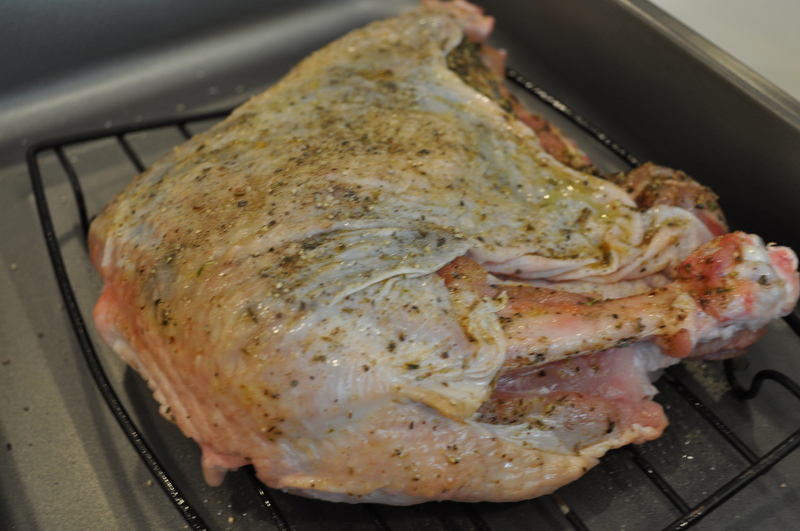 It went into the oven on 300 degrees for the first 45 minutes and was finished at 400 degrees to crisp it up. The verdict? This was by far the best turkey I have made for the holidays. 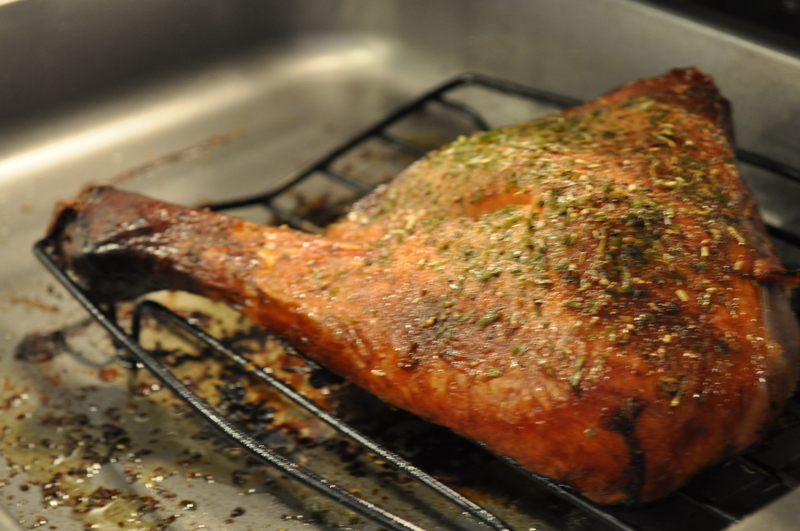 Dry brining is the way to go. 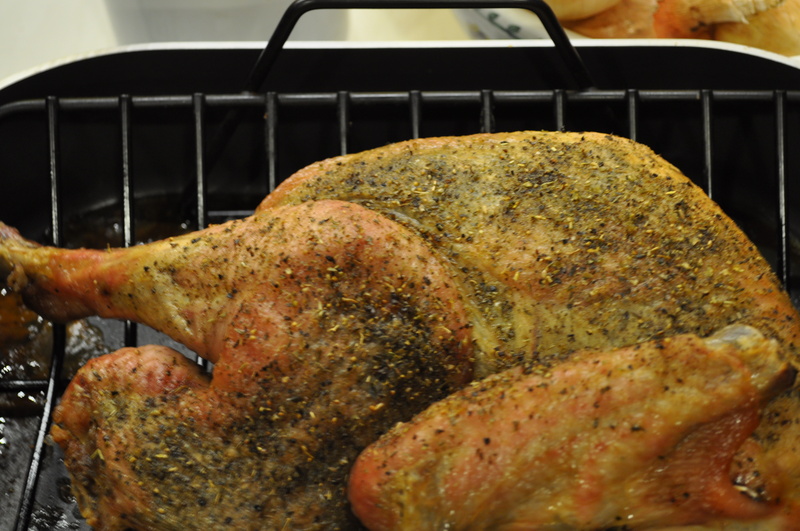 It took 24 hours in the refrigerator to brine this turkey. We ate the wings, thighs and drumstick for dinner, and broke down the breast meat to make a simple turkey Bolognese for two nights of dinner this weekend. Take your favorite Bolognese recipe and substitute turkey for beef. The other breast was dry rubbed. Just a variation by using spices instead of herbs. 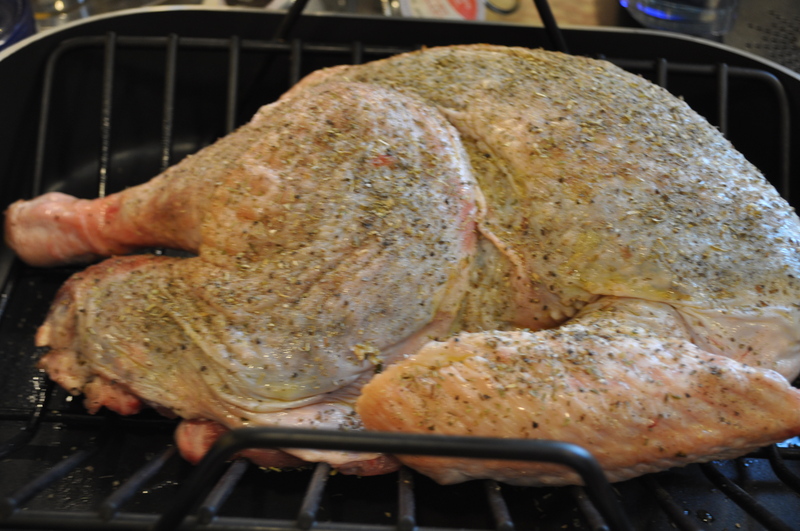 The dry rub included cumin, coriander, paprika, oregano, cinnamon, cayenne and salt. This part of the bird became salad. So tender and juicy. We mixed it with cherries, celery, pistachios, mayo and pickle juice. It has been lunch for most of the past week. Never getting tired of this mix. As for the other quarter, I followed my old wet brine recipe. Cider, oranges, and brown sugar, boiled with a healthy dose of salt. I do agree with the Food Lab assessment. It made the meat mushy instead of sharp and flavorful. Most of this meat went into my soup base. We ended up with two containers of soup base in the freezer. When I bring them out, they will get heated with egg noodles and a bit of stock to thin them down. Also done this weekend, a large pot of stock. Two quarts in the freezer. That one 14 pound bird will be yielding 16 meals for the two of us. Not a bad return on investment. Besides, who gets tired of turkey? Not us. Posted in Farms, Food, Local Businesses, Locavore, Real Food and tagged cooking, farms, Food, foodie, holidays, Locavore, real food. Bookmark the permalink. Another year. More to be thankful for. This year, watching the natural disasters around the North American area, including the Caribbean islands, I am thankful to live in a relatively benevolent region. Think about it. Houston. Florida. California. Montana. Puerto Rico. The Virgin Islands. Smaller islands, belonging to other nations. We can’t forget that those people lost their homes. Their livelihoods. They are still struggling to recover, and it will take a long time. It took a year around here to recover from the Ellicott City floods. Even more for some businesses. I see that Portalli’s is finally going to open again. Sixteen months since the floods. When we give thanks tomorrow, we should think of those who still need help. If we can, we should step up on “Giving Tuesday” and find those still trying to put the pieces back together. Happy Thanksgiving for those fortunate friends and family. Hopefully, a better year for those still digging out. Posted in Commentary, Community, Local Businesses. Bookmark the permalink. Yes, it’s that time of year again. Here in the #hocomd world, Maple Lawn farm’s turkeys are nearing the end of their solar panel shielded sun bathing. 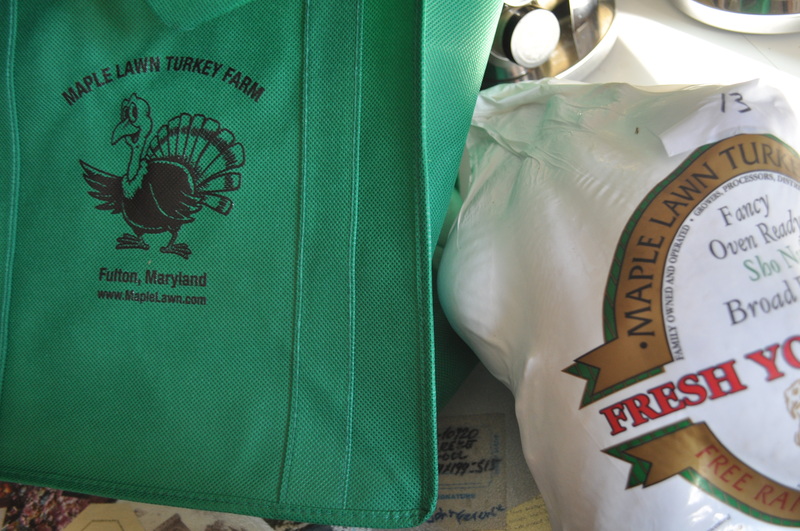 We are so lucky to be able to get fresh turkeys, for a fraction of the cost of some of the options out there. Many places have heritage birds for 5-9 dollars a pound. Here, we can get fresh turkey for $2.29 a pound, $2.30 to pick it up right at the farm. With its own reusable bag. You have many options around here to get their turkeys. Boarmans. Roots. David’s. MOM’s. Whole Foods. And, I hear, maybe at Harris Teeter, but that isn’t confirmed. For the full experience, at least once, you should pick up at the farm. For the craziest experience, do it on Tuesday or Wednesday. Lines out the door, but it does move fast. I go on Monday, so I can let the turkey stay in the fridge one day, then brine it for 24 hours. This year, I may try something different for cooking it. There will be a follow up if this method works. 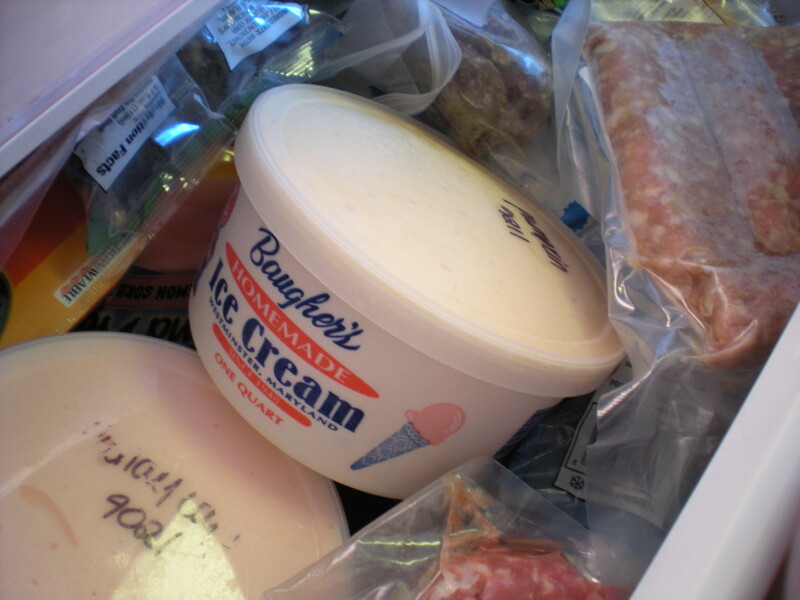 This weekend I also picked up my favorite other seasonal items, like the pumpkin ice cream from Baugher’s. I can’t emphasize how amazing this farm is. They have a bakery, if you want pies for the holidays. They make their own ice cream. They make apple butter, peach butter, all sort of jellies and jams. You can pick your own fruit in summer and fall, and their fruit market is open year round. Worth the trip to Westminster. I go every month after picking up my meat CSA at Evermore Farm. Yesterday I got pumpkin ice cream, pumpkin cookies and a peck of gala apples. On Small Business Saturday, you could knock off quite a bit of your Christmas shopping there, and have lunch at the restaurant. Order the tuna melt, and the CMP sundae. And, a side of apple fritters. Heaven. So, now you have the turkey. You can get the pie and the ice cream, and maybe some cider, at Baugher’s. Next post, in a few days, the wines and the special items. Those pumpkin cookies are calling my name. They won’t last until Thanksgiving. Posted in Adventures, Farms, Food, Local Businesses, Locavore, Real Food and tagged cooking, farms, Food, local businesses, Locavore, real food, traditions. Bookmark the permalink. My favorite weekend of the year is coming up. Back to normal time. That extra hour to sleep, so to speak. Getting the clock back to matching the rhythm of my system. I am not a morning person so Daylight Saving Time in the spring drives me nuts. Other than that, what has been/will be happening around here? Much cooking and reading, through this massive book. Thanks to Howard County Library for long renewals I might make it through the entire 1000 or so pages and learn more about the science of cooking. My blog turned six yesterday. Still going, but not as often. I did start it to record local eating and to promote Howard County Conservancy events. To honor those goals, today’s posts focuses on both those topics. Wanna play in the meadows? Drink cider and run around playing a fun game? Sunday, there are games in the meadow. SCAG, to be exact. What is that? Here is the description for this event at Mt. Pleasant. November 5, 10-noon. Then, on Thursday the 9th, a rare opportunity to see a first rate performance transporting you through history. Appropriate for families with children age 8 and up, here is a chance to see a riveting musical performance that teaches while you enjoy the show. As for the other main reason I started writing, the local food scene, I am pledging to continue to reduce my carbon footprint by eating more meals primarily using locally sourced foods. From my CSA, I am back to buying a flour and grain share. Every other week I get a bag of flour and some type of grain. This past week it was grits. Now that I have perfected that shrimp and grits recipe from Deep Run Roots, Vivian Howard’s homage to east Carolina cooking, I have used grits frequently for variations. Simple to make. Three cups milk. One cup grits. Double boiler, or a pan above a pot of water. It takes time, but is forgiving when it comes to stirring. The gentle heat means no burnt places. Heck, you can even just buy the shrimp from Boarman’s and make the grits. Add some hot sauce. 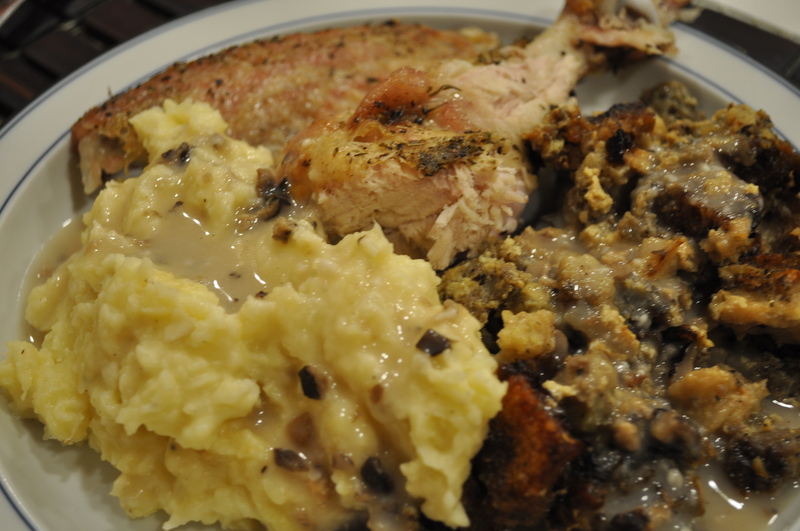 I have been busy cooking these days but forgetting to write about it. Right now, I am cooking my way through The Food Lab. For the cookbook club. New techniques. Old favorites updated. Using the bounty from my fall CSA. 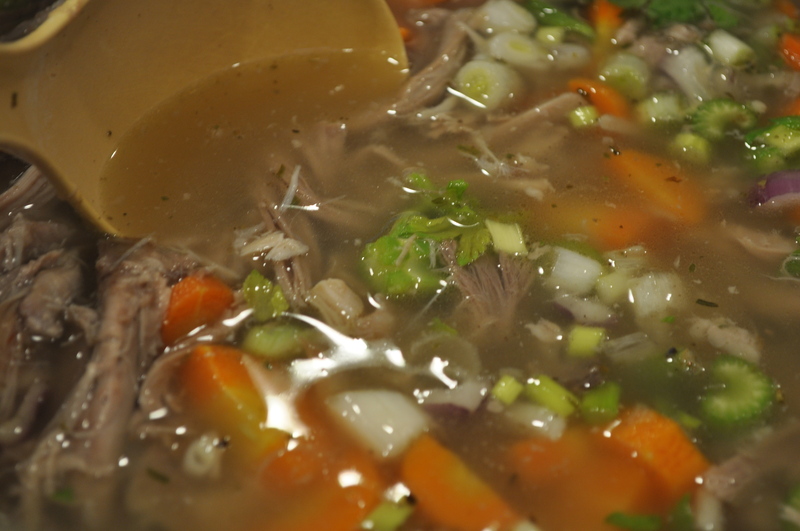 Now you can see why I am focusing on soups, stocks and stews. Many, many ingredients here. Those are white carrots. There is celery. There is a large leek. Escarole, chard. Soup in the fall. My go-to meal. Here’s to a few more blog posts in my future. I haven’t given up writing yet. Just slowing down. Posted in cookbooks, CSA, Food, LFFC, Locavore, Real Food and tagged cooking, CSA, Food, soups. Bookmark the permalink.